How Do I Show the ROI of Digital Marketing to Upper Management? This is a common question – and oftentimes a challenge – for marketers. Whether it’s your sales team questioning marketing’s spend and tactics or upper management wanting you to justify your budget request, it’s difficult to accurately predict marketing outcomes. How do you show marketing’s contribution to revenue and profits, especially if there’s no tangible data? With digital marketing, you gain data and metrics through website impressions, social media likes and shares, email click rates and other analytics. You can establish reports to accurately show your customer’s engagement and conversion and your company’s return on investment (ROI). Yet, how is your already-stretched marketing team – maybe even just a team of 1 – going to have the time and technical skill set to implement, analyze and effectively report a digital marketing program to sales and other stakeholders? How are you going to convey the value to upper management? Whether you are launching a new digital marketing program or are looking for ways to convey the value of your current digital marketing program, you need to bring the right data to the table. I’ve found that oftentimes the ROI data and information that marketers share is not the information upper management is seeking. At the onset of implementing an inbound digital marketing program, there must be clear expectations, roles, responsibilities and goals established. If not, everyone is working from their own paradigm of expectations. This creates a block in communication and understanding, which is critical to your role as a marketer in earning trust and buy-in for what you need. If you’re presenting metrics that aren’t understood, regardless of how wonderful they are relative to an inbound digital marketing program, they have no value, and you’ll walk away frustrated and misunderstood. They likely don’t care about how your social channel grew or how many people opened your emails. They want to see how that relates to revenue and profit. To convey the value of your inbound digital marketing program, you first need to understand what is the definition of “value” to your boss. Establish core metrics (key performance indicators, KPIs) that are mutually understood and then establish a benchmark for those KPIs. Now you have a starting point to compare against. Another perspective on metrics is using your buyer’s journey sales funnel. If you have strategically identified your target audience’s buyer’s journey, then you can identify at each stage what conversion metrics you should be measuring and sharing to accomplish the goals at that stage of the buyer’s cycle. 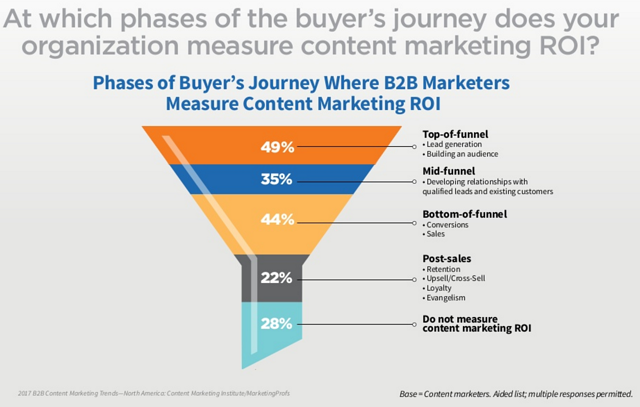 According to the 7th Annual B2B Content Marketing Benchmarks, Budgets, and Trends-North America report, more than 40% of B2B companies are measuring content marketing ROI at the top and bottom of funnels. Customer Acquisition Cost (CAC). The cost to obtain one new customer. It is calculated by dividing your inbound digital marketing cost of investment by the number of clients acquired through inbound. Customer Revenue. The actual revenue generated from your customers. Customer Lifetime Value. The value that the average customer brings to the company over the customer’s lifetime. Demonstrating the ROI of your inbound marketing program to your boss or other stakeholders in your company is critical to the sustainability and growth of your program. Gaining measurable ROI from any form of digital marketing program needs to begin with a well-defined strategy and mutual agreement on goals and metrics. With today’s advanced technologies, top performing programs are utilizing automated marketing platforms such as Hubspot, where they can collect the necessary conversion metrics required to show success of the program. I haven’t worked with a CEO yet that gets excited about vague ideas and concepts. They are looking to you as the marketing director to have a defined strategy with measurable results. They want proof the benefits outweigh the costs of their investment. They want ROI metrics that relate to their bottom line. Need help understanding how to establish ROI metrics for your inbound marketing program? Take advantages of a free inbound marketing advisory call with a Marketing Essentials inbound expert by reserving your call here.